Advertisements of Crane in old Shanghai: first two from the left is, middle one proclaimed their shoes had the “thickest skin” in the world; right one with the giraffe stated that its quality was so high that it couldn’t get any higher. Jefferson Young first came on the scene in 1936 at the age of 22 when his father opened Crane Stores, Shoers & Hatters in Shanghai, whose name was based on a poem about a crane which stood out from the peck and whose calls were heard all over the land. Directories from the 1940s listed Young as a native of Shanghai but other sources suggest that he was Ningbonese (for example he was a director of the Ningbo Residents Association of Singapore). He took over Crane shortly after its opening as his father went blind and through his mastery of the 4Ps of marketing (product, price, place and promotion), the firm quickly stood out in the marketplace and expanded nationwide within a few years. In terms of product, Crane carried the largest variety and the trendiest shoes and delivered high quality service with high degree of customization. In terms of price, Crane was big on discounts and adopted pricing that ended with 9s such as $29.99 and $39.99 to give customers a sense of bargain. For place, Jefferson always picked the busiest shopping streets for his stores. And finally, Crane was probably best remembered for its promotion with its memorable advertising campaigns. 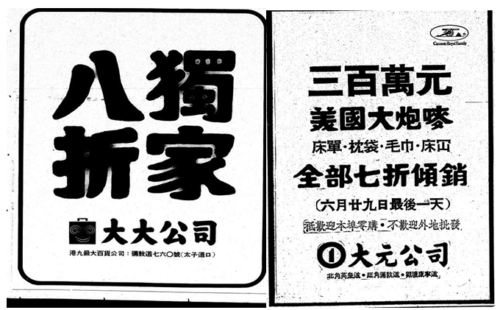 From 1936 to 1949, there were at least 160 ads of Crane Stores that appeared in Shanghai’s top Chinese newspaper Shen Pao (申報). Many of these ads featured catchy cartoons with memorable taglines which touted the quality of its shoes with stylized fonts, black rims and lots of empty space that captured attention. Store openings were often attended by celebrities and movie stars. Over the decades, Jefferson Young applied this 4P playbook successfully to his different retail ventures across Asia. In 1939, Crane opened its first branch on Nanking Road, which was and remains the busiest shopping street in Shanghai. 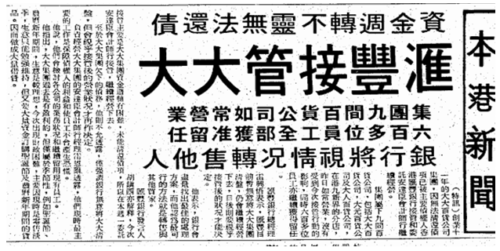 By 1941, a branch was opened at 163 Des Voeux Road Central in Hong Kong where many Shanghainese had fled to as the Sino-Japanese War intensified and the 27 years old Jefferson Young was already hobnobbing with leading tycoons and actors of the time as shown by the article below. 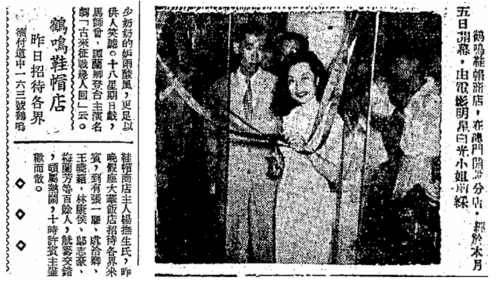 After the War, the firm’s 8th branch was opened in Canton in 1948 by Miss Hong Kong and singer Szema Yum (司馬音) and by the time of the Communist takeover, Crane had 13 stores in Shanghai, HK, Canton, Nanking, and Changsha plus manufacturing operations to make its own branded shoes and Jefferson was well known across China as the “King of Shoes and Hats”. In his native Shanghai, Young was chairman of the Shanghai Shoe Merchants Association (上海市鞋商業同業公會), the Shanghai Shoe Industry Primary School (上海鞋業小學) and a Senator and urban design committee member in the city government at the time. In 1950, a branch was added in Macau and in the spring of 1951, Jefferson left Shanghai and the mainland where his business was being confiscated for Hong Kong where branches were also set up at 534 Hennessy Road in Wanchai and 608 Nathan Road in Kowloon in addition to the Des Voeux Road location. In 1952, Crane expanded to Singapore where it opened a store at 198 South Bridge Road (touted as its 18th store). Over time, Crane would have a branch in Penang and Young also opened Hongkong Shoe Co on North Bridge Road in Singapore and Petaling Street in Kuala Lumpur. A branch was also added in Taipei but shut down in 1957. In 1958, Crane Stores, Shoers & Hatters Ltd was incorporated in Hong Kong with $750,000 in capital – the name was shortened to Crane Stores Ltd in 1963 as the firm expanded from shoes to the more ambitious field of general department stores. For someone with big ambitions like Jefferson Young, expanding from shoes to department stores was a natural progression. A globally minded businessman, Young often traveled to Japan and the US to source merchandise and in the late 1950s and early 1960s, discount store chains such as Korvette and Spartan had emerged as a major force in US retailing. 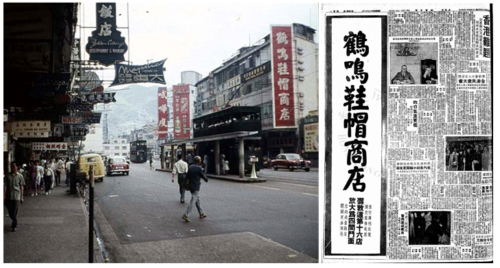 Sensing that the business model of discount stores (“Business in Millions, Profits in Pennies”) might also work in HK, Young opened Bargain Centre in early 1961 (one year before Walmart, Kmart and Target were established in the US) as one of HK’s first discount retailers. For the location, he picked the Buckingham Building at 319 Nathan Road, which he described as the “Mongkok of Mongkok” (Mongkok also stands for “popular corner” in Chinese). The manager of the store was Michael Wang (王朝平), a graduate of St John’s University in Shanghai. Bargain Centre was renamed The Chancellor (the Chinese name means “Big Man”) within a few years and relocated to 608 Nathan Road and thanks to low price and wide selection, it was a success and achieved daily flow of 40,000 customers in December 1965. In 1970, Young opened a branch of the Chancellor in Outram Park in Singapore. Left: the copies of the Chancellor magazine with covers featuring paintings by masters such as Qi Baishi from Jefferson Young’s collection. Right: The Chancellor editor Shen Wei-chuan (left) and Cantonese opera star Tang Wing-cheung (right) in Taiwan in 1975 for Chiang Kai-shek’s funeral. 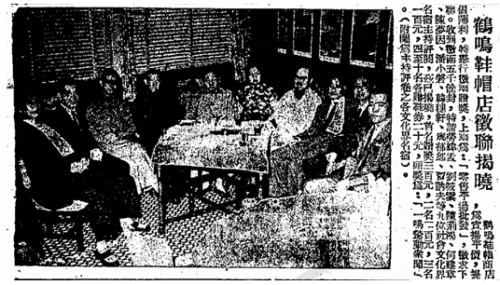 A patron of arts for decades, Young backed Shanghainese editor Shen Wei-chuan (沈葦窗, 1918-1995) in launching a new magazine on culture and history in 1970 which featured articles from an all-star list of contributors. Because of the sponsorship, the publication was named The Chancellor (大人) and the cover of every issue featured a painting by modern Chinese masters such as Qi Baishi, Lin Fengmian and Zhang Daiqian from Young’s personal collection (in fact he donated one of the Zhang paintings from his collection to benefit the HK Arts Festival in 1975). Eventually Young and Shen parted ways in 1973 and Shen renamed the magazine Panaroma (大成 in Chinese) which was published until his death in 1995. In the 1960s, Young also launched Everybody’s Department Store with branches at 641 Nathan Road in Kowloon and 338 Hennessy Road. 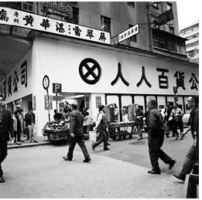 Both Chancellor and Everybody had logos which looked similar to Daimaru, the first Japanese department store in HK (opened in Causeway Bay in 1960) and featured many Japanese goods, so much so that the anti-Japanese protests in the early 1970s targeted The Chancellor despite the fact that it being 100% Chinese owned. Left: Da Da ad promoting its 20 percent off discount; Right: Number One’s ad promoting 30 percent off sale of Cannon Royal Family towels and sheets. In April 1974, Jefferson Young incorporated Da Da Department Stores Ltd with HK$10 million in registered capital and in June opened its flagship store (which claimed to be the largest department store in HK) at the newly constructed Cosmopolitan Centre (東海大廈) at 760 Nathan Road in Mongkok built on the site of the former Prince’s Theatre (東樂戲院). The store had many special features such as full-scale model railroad and bumper cars in the children’s department, a floor for special discount items and a mini HSBC bank branch. The store was the first to offer 20 percent discount on all items on Sundays and 20 percent discount on credit card purchases which attracted lots of shoppers. 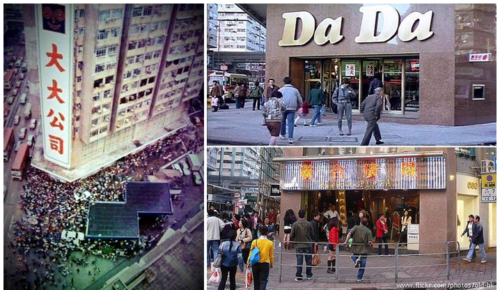 Within a decade, Da Da expanded to 7 stores including branches in Chung On Street in Tsuen Wan and Wah Fu Estate in Aberdeen. A sister chain by the name of Number One Department Store (大元公司) was also launched with branches on King’s Road in North Point, Nathan Road and Hong Ning Road in Kwun Tong. By the mid-1980s, the Da Da Group had annual turnover of close to HK$400 million. To complement his retail business, Young opened a number of restaurants such as a Cantonese restaurant above the Number One store in North Point, the Jumbo restaurant on Portland Street in Mongkok and the Jade Palace above the Da Da store in Aberdeen which served Cantonese, Hunanese, Szechuan and French cuisine. None of these restaurants were profitable and were eventually shut down but the bigger problem for the Da Da chain was real estate. Unlike its competitors such as Wing On and Sincere, it did not own most of its stores making vulnerable to soaring rent. Aside from the site of The Chancellor in Yaumatei which was their own property, majority of its stores were rented with the annual rent at the Da Da flagship store on Nathan Road exceeding US$1.2 million per year. To address this, Da Da acquired 3 floors, 250,000 sq ft of retail space at the newly developed City Gardens in North Point for over HK$300 million and opened its largest store there in December 1983. Through Young Ching Huo Ltd (楊慶和有限公司, ironically the same name as a famous bank in old Shanghai which failed), the Young family also acquired many residential units for investment purpose. The timing of the aggressive investments was unfortunate as the HK economy was in a recession due to the confidence crisis at the time and the Da Da group found itself in financial troubles. When Da Da experienced cashflow problems in July 1985, HSBC as one of Da Da’s major creditors, stepped in and placed the firm and its 9 stores (including Number 1, Kittyland and Everybody) in receivership. Within 20 days however, a joint announcement was made that Da Da was allowed to continue operations as the Young family had pledged to restructure its debt and explored injecting new capital into the firm (aside from collecting art, Young also sang opera with fellow Shanghainese tycoons such as shipping magnate TY Chao, ST King of Wearbest, D.H. Chen of Nan Fung and T.Y. Wong of HK Spinners and it was rumored that he was able to raise $100 million from his friends). Unfortunately, various efforts to rescue Da Da (including potential sale to competitors) ultimately failed and on March 1986, the Da Da chain was forced into liquidation and its 700 employees were laid off as a result. The liquidation sale created a frenzy with lines of shoppers flocking to the stores, even crashing some gates. In 1988, Allied Properties acquired the old site of the Da Da flagship store and turned it into a shopping mall named Allied Plaza. The City Gardens store also became a shopping mall. The Nathan Road site of Number One was taken over by the apparel giant YGM Group and re-opened as the group’s first department store Bigo (新大元百貨, “New Number One” in Chinese) in 1987 which did not last. After the collapse of Da Da, Jefferson Young relocated to the US with his family where he died in 2001. Jefferson Young had at least two wives and many children. In 1958, the shareholders of Crane Stores were listed as Jefferson Young and his wife Yvonne Sun (沈怡紅, who was manager of Everybody’s) who lived together at 9 Suffolk Road (later the office of Robert Chua Productions and now TutorTime Kindergarten) and a Margaret Koo Young who lived in 155 Argyle Street, presumably Jefferson’s other wife. In 1985, the directors of Da Da were Jefferson, Yvonne and their sons John Young (楊詠壯), Tom Young (楊詠東) and Morley Young (楊詠慕) with Jefferson owning 76% of the firm, Yvonne and 3 sons each hold 1% and Crane Stores and Young Ching Huo Ltd each holding 10%. There was also a Robert Young (presumably another son) who was assistant general manager of Crane Stores in 1976. Jefferson’s other children who were not involved with the family business include his son Jimmy Young (楊占美, 1944-1986) who studied business in the US and married Connie Chan (陳寶珠), the most popular HK actress of the 1960s in 1975. The marriage unfortunately ended in divorce in 1982 and Jimmy also died at a relatively young age of 42 in 1986, the year of Da Da’s demise. Connie Chan was not the only showbiz connection for the family as one of Jefferson’s daughters May Young (1947-79) was married to Tony Asher, the son of Hollywood silent film actress Laura La Plante (1904-1996) and 20th Century Fox TV production head and Warner Brothers UK studio head Irving Asher (1903-85). In recent years, another son of Jefferson – Professor Wise Young (楊詠威)of Rutgers University has received a lot of press coverage as one of the world’s top neuroscientists and stem cell researchers. This article was first posted on 8th January 2017.